Periodontal disease, or gum disease as it’s often called, occurs in the gum and bone around the teeth, some people are more susceptible to gum disease than others, and while inherited factors might be involved, good dental hygiene is key to keeping it at bay. 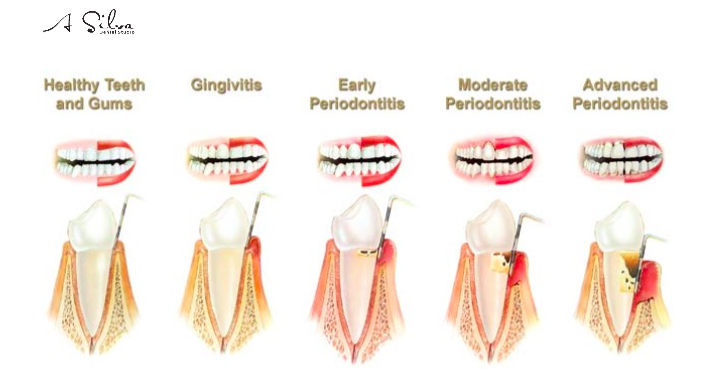 If gum disease is left untreated, gaps called pockets can form between the gums and the teeth and became infected. Eventually teeth can become loose and may have to be removed. They build up of plaque on the teeth is the cause of gum disease. Plaque is constantly forming on your teeth and harbours bacteria. If plaque is not removed it can turn into a hard substance called calculus or tartar which builds up more plaque making it harder to clean this will result in damage to the gum attachment of your teeth. Tartar can only be removed by a dentist, hygienist or therapist. Gum disease is often painless, but may also cause bleeding, red, swollen or tender gums, other symptoms include loose teeth, an unpleasant taste in the mouth or bad breath. Regular check-ups are important because, although you might not notice any symptoms of gums disease, your dentist will notice them. Anyone can get gum disease, but some people have a greater than average risk. If you smoke or use tobacco, you are more likely to suffer from gum disease or to experience the more severe forms of it. Smokers have also been found to heal more slowly after treatment. Diabetics and people under stress or with other medical conditions can also be at higher risk of gums disease. The specific treatment will depend on how advance the gum disease is, but it will involve removing plaque and tartar from above and below the gum. Complications can arise from treatment, resulting in sensitivity, incomplete healing and, rarely, a gum abscess. Your dentist will discuss your treatment and any risk with you. Removing plaque regularly is the best course of action. Thoroughly brush your teeth and get at the plaque that hides between your teeth by using dental floss or another method of interdental cleaning. Your dentist, hygienist or therapist will help you find the best method for you.